Under severe attack over terrorism emanating from its soil, Pakistan’s Foreign Affairs Advisor Sartaj Aziz on Sunday hit back saying it is ‘simplistic’ to blame one country even as he raked up the issue of strain in Indo-Pak ties at the Heart of Asia conference on Afghanistan. Aziz asserted his attending the meet despite ‘escalation’ along the Line of Control was testimony to Pakistan’s ‘unflinching’ commitment for lasting peace in Afghanistan and expressed unhappiness over cancellation of South Asian Association for Regional Cooperation Summit in Islamabad in November, terming it as a setback to regional cooperation. He did not mention the issue of Jammu and Kashmir. 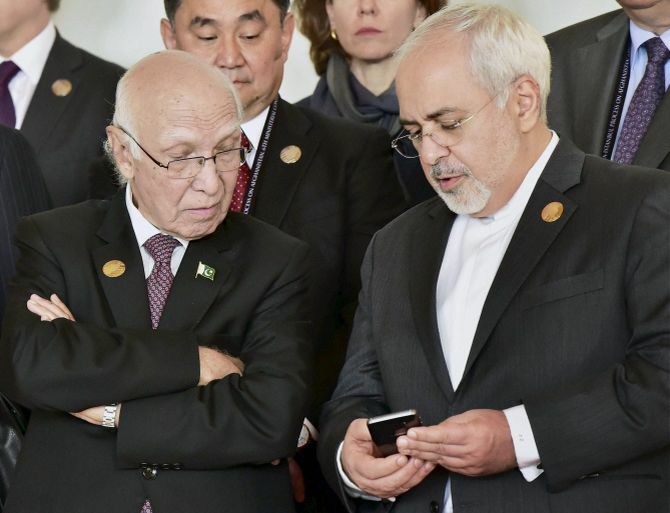 Noting that Pakistan was aware about serious challenges being faced by Afghanistan, Aziz said, “The first and foremost in our view is continuing violence and acts of terrorism claiming scores of human lives. This needs to be addressed urgently and effectively through collective efforts. His response came after India and Afghanistan hit out at Pakistan for sponsoring and supporting terrorism and called for ‘resolute action’ against terrorists as well as their masters. Afghan President Ashraf Ghani, who jointly inaugurated the annual ministerial conference in Amritsar along with Prime Minister Narendra Modi, directly hit out at Pakistan for ‘launching an undeclared war’ against his country and demanded an Asian or international regime to verify Pak-sponsor terror operations. In his address at the HoA conference, a platform for Afghanistan's transition, Aziz said, “My participation in the event, despite escalation on the Line of Control and the Working Boundary with India, is testimony to Pakistan’s unflinching commitment for lasting peace in Afghanistan and the region. “I look forward to meaningful deliberations today towards this objective,” he said and pressed for a politically negotiated settlement of the Afghan issue. Observing that regional cooperation plays an important role in ensuring political stability and promoting economic cooperation, he said postponement of the SAARC Summit scheduled in Islamabad in November was a setback to these efforts and ‘undermined the spirit of regional cooperation’. “SAARC is an important forum, not only for promoting regional cooperation but also for the improvement of relations,” he said. India had pulled out of SAARC Summit, citing cross-border terror strikes emanating from Pakistan. Afghanistan and other SAARC countries had also sought cancellation of the eight-nation meet on the grounds that there was incitement of terrorism in the region. Aziz said the peace process for talks between the Afghan government and Taliban has not yet produced positive results and Pakistan has been making ‘serious efforts for facilitating the peace talks’. “In our view, there is no military solution to the Afghan conflict and all our efforts should be to achieve a politically negotiated settlement through an Afghan-led Afghan-owned process,” he said. He said Pakistan deeply values the Heart of Asia-Istanbul Process in promote Afghanistan’s connectivity with neighbouring and regional countries for durable stability in Afghanistan. “Afghan security forces have firmly and bravely stood their ground in repulsing militant and terrorist attacks. The international community has reiterated its commitment of support to Afghanistan in the areas of security and economic development up to 2020. “The government and people of Pakistan stand in complete solidarity with the elected government and people of Afghanistan in furthering the objective of peace, stability and development in Afghanistan. “We would do whatever we can to help achieve this objective,” he said. The conference is being attended by over 30 countries, including Russia, China, and the United States. “The Afghan Government has also signed peace agreement with Hizb-i-Islami Afghanistan (HIA). The implementation of this peace deal can serve as a model for talks with other insurgent groups in future,” he said. Calling for enhanced regional connectivity to stimulate economic development, he said Pakistan was building its national rail, road and energy transmission network to meet with the growing regional transport needs. “The focus is on modern, state of the art infrastructure including through the China Pakistan Economic Corridor (CPEC). “There is immense potential for connecting our transportation and energy infrastructure with Afghanistan, and other countries of West and Central Asia,” he said. He said Pakistan was committed to enhancing facilitation for transit of Afghan goods through Pakistan. “We believe the two sides need to work together for extension of and improvements in the Afghanistan Pakistan Transit Trade Agreement,” he said. The postponement of the SAARC Summit scheduled in Islamabad in November 2016 was a setback to these efforts and undermined the spirit of regional cooperation. He voiced hope that the deliberations would be constructive and focused on the efforts for lasting peace and stability in Afghanistan, which is our shared objective. Pakistan also welcomes the invitation of Azerbaijan to host the 7th Ministerial Conference of the Heart of Asia process in 2017 and looks forward to its active participation in this Conference, he said.